Jason Reitman's adaptation of Walter Kirn's novel Up in the Air is magnificent. It is a true gem in 2009. It helps that Reitman cast the always charming George Clooney in the role of Ryan Bingham. A character that is hired to travel around the country firing employees from the various company's. Clooney absolutely drips of charm in his character once again. Up in the Air is filled with unbruised dialogue delivered by Clooney and the rest of the talented cast. Anna Kendrick is particularly staggering as Bingham's newly hired assistant. Another surprise delight is Danny McBride, playing Ryan Bingham's soon to be brother-in-law. Up in the Air is a witty dramedy but it contains a very touching story as well. The story itself will most definitely not garnish the same reaction from every viewer, but I for one walked away completely satisfied. Billed as the game changer, Avatar is exactly that. 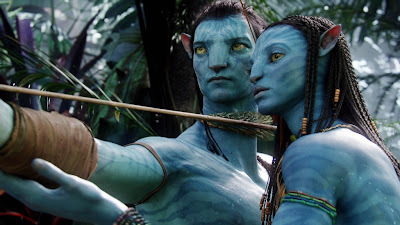 Avatar is the first 3D CGI that actually sweeps you away. I will admit I had major doubts that James Cameron's Avatar would be anything to write home about. I was proved wrong by a true master in cinema making. Cameron did not create a new story by any means, but he did in fact create a whole new world that is immensely captivating. The attention to detail that went into the 3D and CGI in this movie is legendary. The story itself is draws a lot of similarities from movies we've already seen, however I found this to be a positive which allowed for the viewer to become completely immersed in the film. If someone told me I would have two SciFi movies in my Top 10 that both dealt with human and alien relations, I wouldn't have believed them. But here we are! District 9 is a movie no one saw coming. It is a shot in the dark that is mind blowing. Director Neill Blomkamp created a unique story that took apartheid and race relations in Africa and put it on a SciFi level. The result is both stunning and enamoring. The film is unique in the fact that it is presented in a quasi-documentary format, but then shifts into an all out action extravaganza! The film is both touching and entertaining and easily is deserving of a Top 10 spot. A film I was both worried and excited for ended up being something I embrace without any reservations. 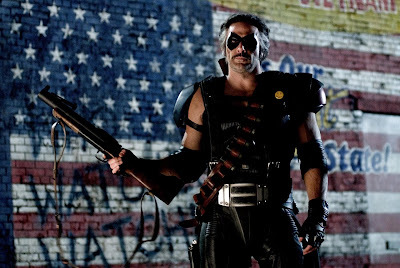 Watchmen seemed like an impossible comic to adapt, but Zack Snyder did the near impossible. Snyder is able to take images from the page and put them in motion on screen in a polished and stylized way. Snyder did have to pick and choose which elements from the lengthy comic to remove, but he does a wonderful job. I must note that the Ultimate Cut of Watchmen is the pinnacle version to watch, but the theatrical release was a near perfect adaptation of a comic I've held dear to my heart since the 1990's. The Fantastic Mr. Fox is a fantastic throwback to the days of old stop animation. Director Wes Anderson decided to take a step back from all of the recent trends and deliver a stop-motion animated film that is a instant classic. The Fantastic Mr. Fox has a flawless voiced cast that does a hilarious job of voicing all of the woodland creatures throughout the Ronald Dahl tale. 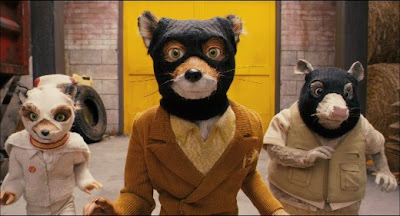 Like any of Wes Anderson's other films, Mr. Fox is housed with layered dialogue that makes for a side-splitting endeavor on each repeat viewing. The animated film is perfect for all ages and is instantly enjoyable. The Hurt Locker is a true white knuckle masterpiece. The military drama set during the current Iraq conflict is one of the most gripping films I've seen this year. Like the members of the bomb squad in The Hurt Locker the viewer is hammered with heart stopping situations all the way through. The performances throughout director Kathryn Bigelow's film are mesmerizing. Jeremy Renner commands the viewer's attention in every frame he is in. The portrayal he delivers is jaw dropping, but more so is the mind set these soldiers have to put themselves into in order to survive on a daily basis. I always love a film that follows a downward spiral and Werner Herzog's Bad Lieutenant: Port of Call - New Orleans is a superior effort to say the least. Actor Nicolas Cage has delivered over-the-top performances in the past, but none as stirring as the one he portrays here. Watching as Lt. McDonagh goes further and further down the rabbit hole is immaculate. While we have seen stories of corrupt cops before, none have electrified the screen in a way Nicolas Cage does in Bad Lieutenant. What's more is the film really does come full circle. I won't spoil the ending, but it was a perfect closing point to a mind-trip of a movie. No other director has the balls like Quentin Tarantino! He breaks the fourth wall and outright claims he may have delivered his masterpiece and I couldn't agree more. 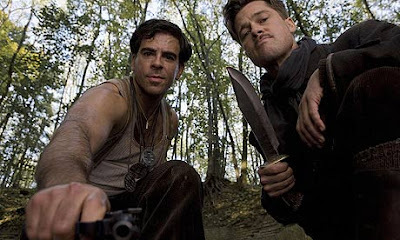 Inglourious Basterds is Tarantino's most completed work to date. A Tarantino film always houses remarkable performances, but here everyone within the film is letter perfect. If Christoph Waltz does not win for Best Supporting Actor this year, something is definitely wrong. Not to mention Brad Pitt, Melanie Laurent, Eli Roth, Daniel Bruhl and Michael Fassbender. Absolutely stunning. Lastly Inglourious Basterds has one of the best scores of the year, including the infectious finale Rabbia E Tarantella. Never before have I been so utterly linked with a character, like I was in The Road. It is the most grim film released in 2009, but at the same time it is also the most hopeful. The bare bones story focuses on one of the most simplest human traits, survival. However there is far more beneath the surface. The film perfectly illustrates the unyielding love a parent has for their child. The lengths that they will go to in order to protect them. The Road also teaches core morals that we has humans hold dear. When everything else is lost in the world a father still tries to teach his son core values. Equally his son returns the favor by reminding his father of these life lessons in key moments in the film. I have been a big fan of director John Hillcoat since his directorial debut with The Proposition and he did a unmarred job of adapting Cormac McCarthy's post-apocalyptic story of survival. Actor Viggo Mortensen reminds me again why he is such a superior actor and in my humble opinion Mortensen deserves a nomination for his portrayal. It is fitting that my favorite childhood book is my favorite film in 2009. Spike Jonze did a unsurpassed job a recreating Maurice Sendak's tale. Jonze and David Eggers together created a screenplay out of a children's tale that had maybe 10 sentences in all, but together they captured the very same message throughout the 101 minute film. There has been plenty of talk as to whether Jonze's adaptation is made for children. My stance, Spike Jonze created a film that children can understand and appreciate now and only gain more from as they grow. Everything about Where the Wild Things Are is flawless. 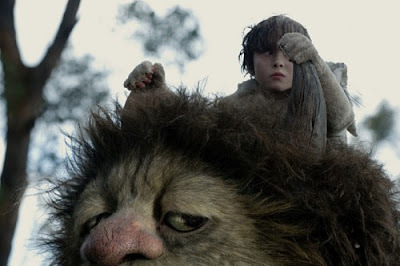 The actors, the special effects, the Wild Things, the emotions dealt with and the music. Absolutely flawless. Karen O did a knock-out job with the score and captured the tone from Sendak's tale and Spike Jonze's adaptation. I re-watched the movie a few days ago and was completely enamored all over again.